Species counts continued to mount during our various 2018 blitz events (described below). In November of 2018, we reached 2425 species. In addition, we began adding species observations from pre-bioblitz lists. The additions bring our total to over 2600 species. Andy MacKinnon explains to the MycoBlitz crew how the blitz will work. Pic by Kem Luther. 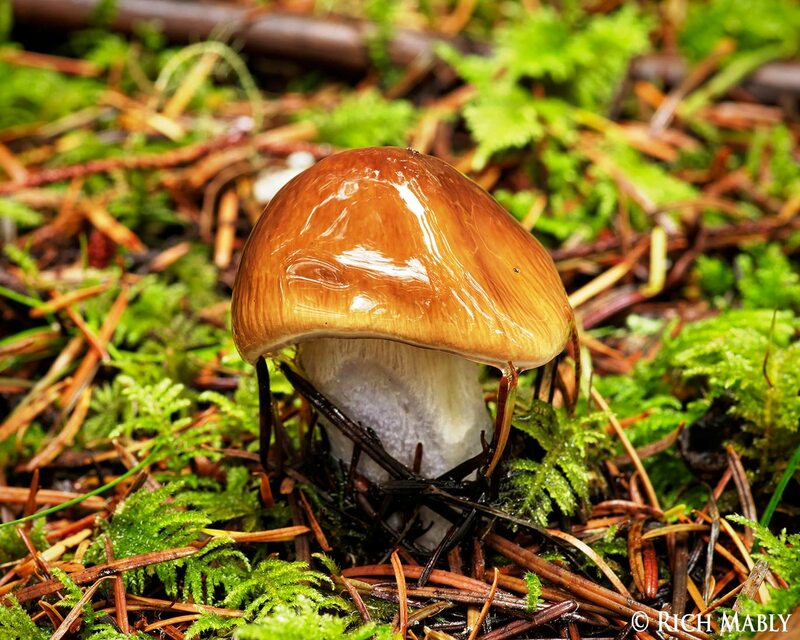 The Metchosin Biodiversity Project had nearly perfect conditions for its Sixth Metchosin MycoBlitz in 2018 -- rain and no frost in the days before the count, almost no rain and warmish the day of the count. 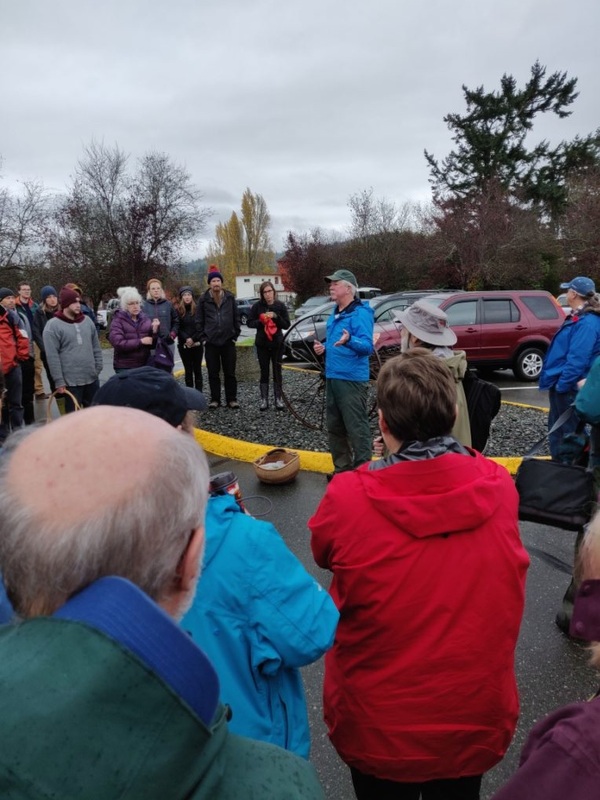 Sixty people showed up outside the District Council Chambers at 9:00 am on Saturday, December 3, 2018, to help with the count. About a dozen of the people on the Saturday forays were invited experts. The experts divided themselves into three groups and others joined the groups. One group went to Camp Thunderbird, another to Blinkhorn Lake, and a third group to Pearson College. Administrations at Camp Thunderbird and Pearson College kindly gave permissions for the MycoBlitzers to use their properties. 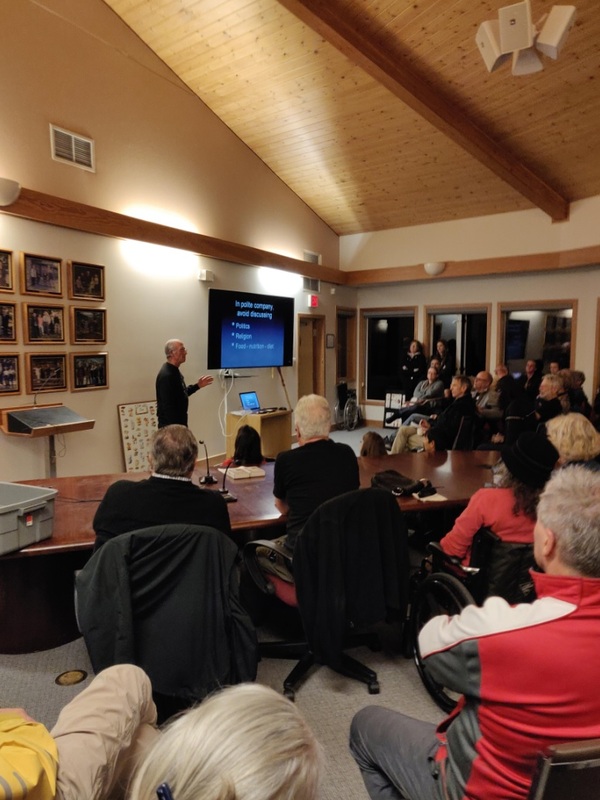 The MycoBlitz kicked off on the evening of Friday, November 2, with a talk by Dr. Denis Benjamin. Dr. Benjamin is the author of a book on the health effects of mushrooms (Mushrooms: Poisons and Panaceas) and of a recently published collection of mushroom foraging essays (Musings of a Mushroom Hunter: A Natural History of Foraging). He is past Chairman of the Toxicology Committee of the North American Mycological Association. The talk was on the use of mushrooms as food. After the Saturday foray, the three teams brought back their collected mushrooms. 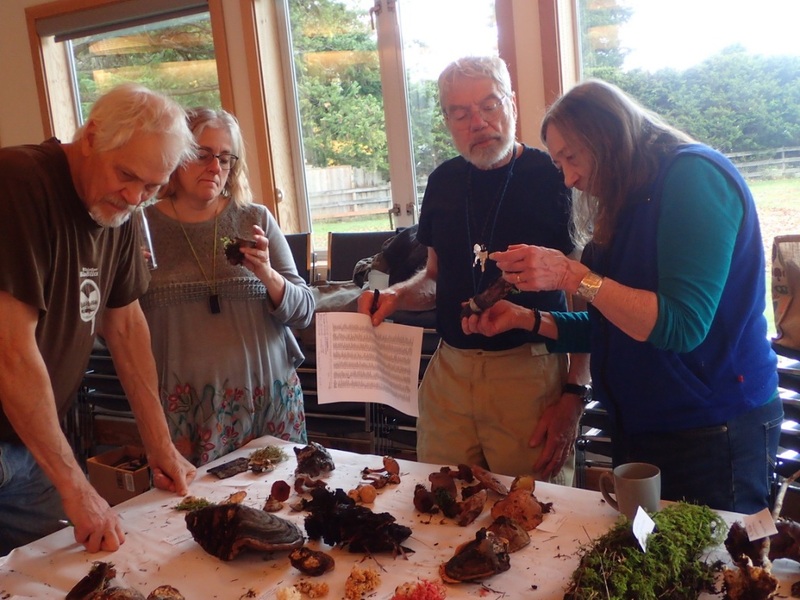 While more than forty helpers went to Metchosin House to see the film "Know Your Mushrooms, experts ate a quick lunch and began to lay out the mushrooms on tables and attach labels to them. 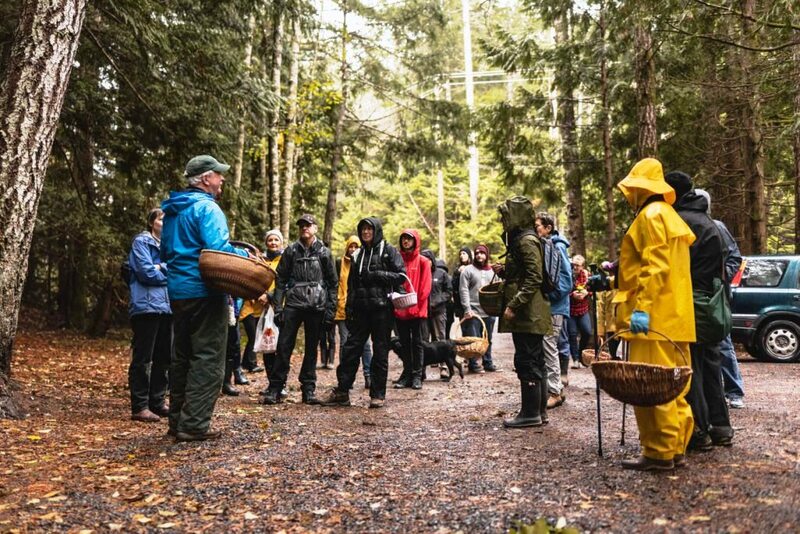 From 2:00 pm to 4:00 pm, people streamed through the door of the Metchosin Council Chambers to see the mushrooms that had been gathered and identified. Laid out on the table were over 130 different species. Some visitors brought in their own mushrooms to be identified. In all, a successful MycoBlitz. 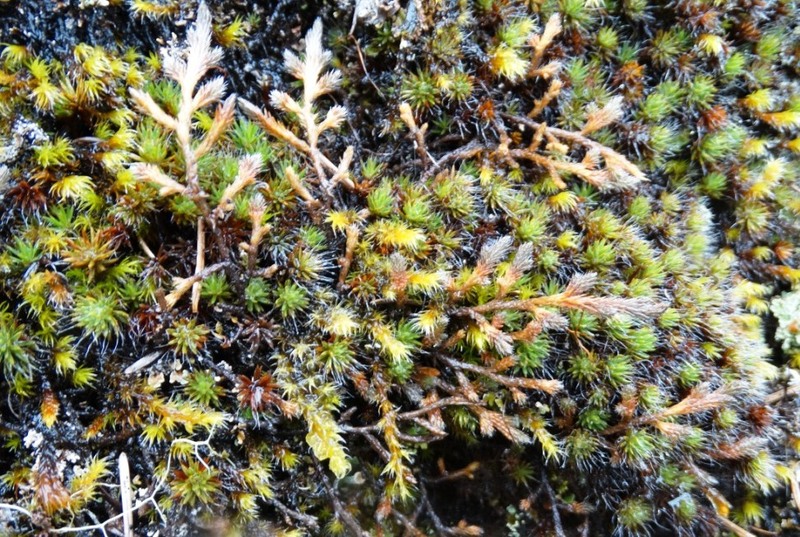 Searchers at the MycoBlitzes and BioBlitzes have found almost 500 different species of fungi. A few mushrooms have been identified at the spring and summer outings of the BioBlitz, but most have been found at the six fall MycoBlitzes. The chart at the right shows the number found each year. In any given year, about a fifth of the mushroom species found are new to the Metchosin species database. The Metchosin Biodiversity Project linked hands with CRD parks this summer to bring you a new and improved Metchosin Biodiversity Day. We were at a tent table during the CRD Parks Marine Day event on Saturday, July 14, from 10 am to 1 pm. People dropped by to visit us at the tent and to see the results of the CRD beach seine and scuba-diving for marine organisms. Naturalists from the Metchosin Biodiversity Project and HAT led several walks to look at beach plants, the estuary environment, and the Witty woods. Here was the day's schedule. 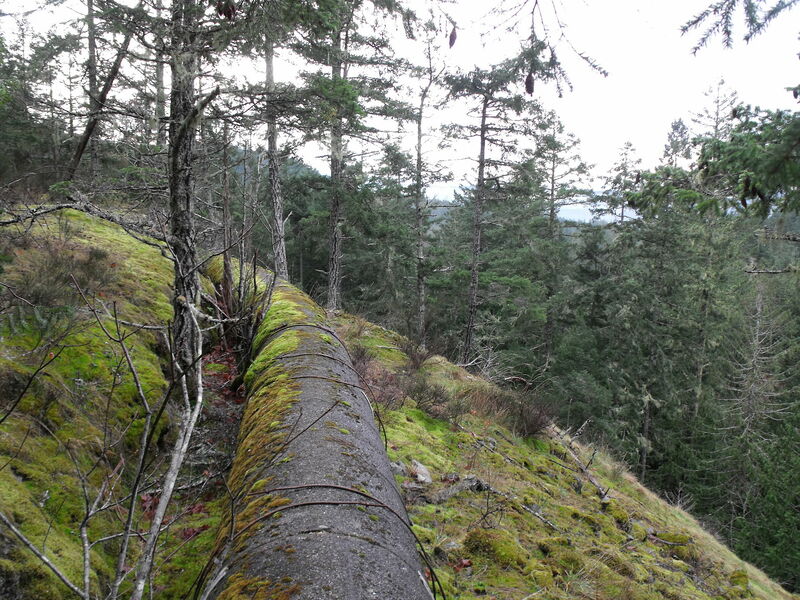 The Sooke flowline. It is wide enough to walk along. Picture from Wikimedia. Click for larger version. On the tip of the District of Metchosin that juts to the northwest are several parcels of crown land. These lie on the right side of the Sooke Road for the traveler going from Langford to Sooke. They are forested properties that were expropriated from pre-WWI property owners so that the City of Victoria could accommodate a water flowline. 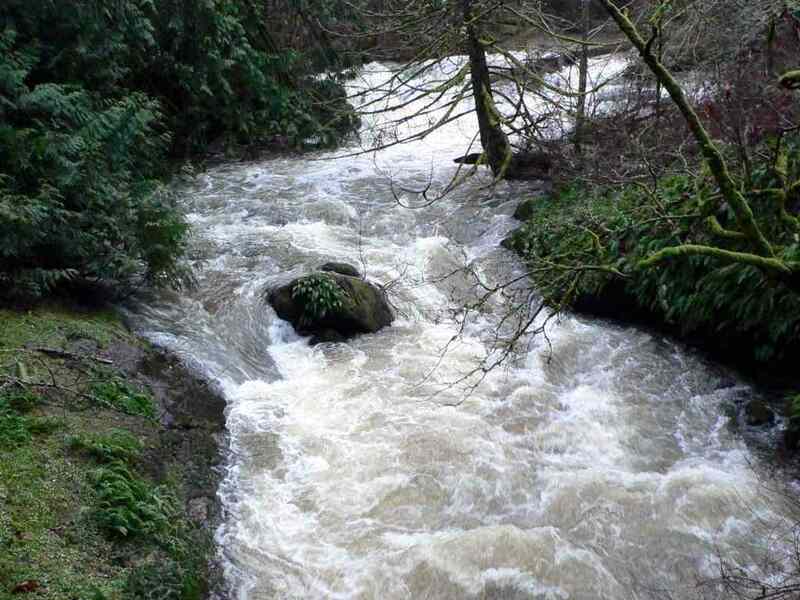 The flowline supplied residents of Victoria with water from Sooke Lake. The 44-kilometre flowline is composed of concrete pipe that is over a metre in diameter. Marked trails in these crown land parcels are relatively scarce. Access to the parcels is either via private property, or from a handful of points along Sooke Road, or from Impala Road, a no-exit road which cuts across the parcels from south to north. On the map at the right, these lands are designated Section 64, 66, and 67. The crown parcel that is Section 62, which is leased to Camp Thunderbird, is similar to these other parcels. Map showing three of the crown land parcels, sections 64, 66, and 67. Section 62, unlabeled, is on the left side of the map. Click for larger version. 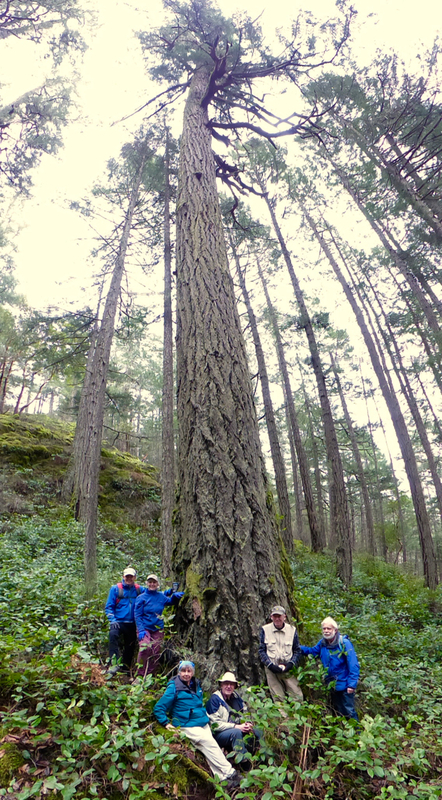 The exploration team at one of the Douglas-fir giants in section 66. Left to right are Joel Ussery, Moralea Milne, Gerry Allen, Kem Luther, Hans Roemer, and Joe Antos. Picture by Andy MacKinnon, also part of the team. Click for larger version. The Metchosin Biodiversity Project decided that its 2018 project would be an inventory of species in these crown land parcels. The project began in late winter with two trips to explore access to these parcels and to get the lay of the land. The exploration group found access points where larger teams could be sent to conduct the actual surveys. 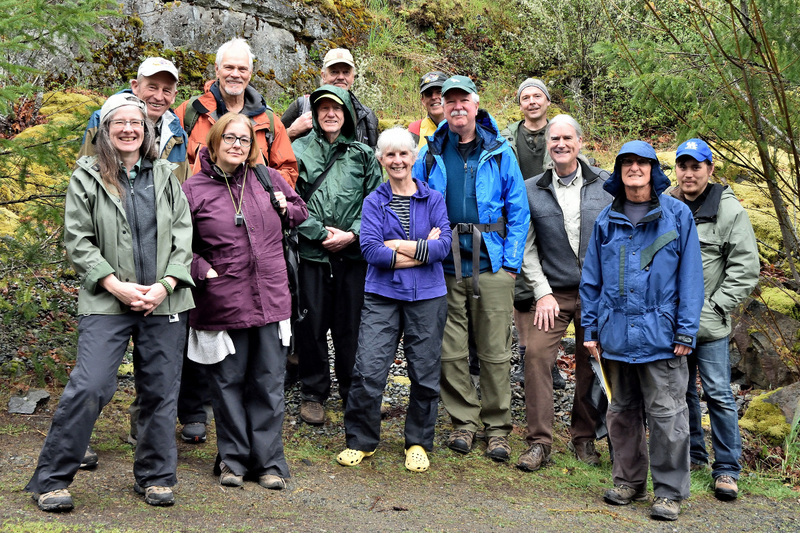 The BioBlitz survey group, pictured here, convened at Moralea Milne’s Camas Hill house on Saturday, April 28, 2018, at 9 am. Waiting for the crew were breakfast rolls, scones, coffee, and tea. 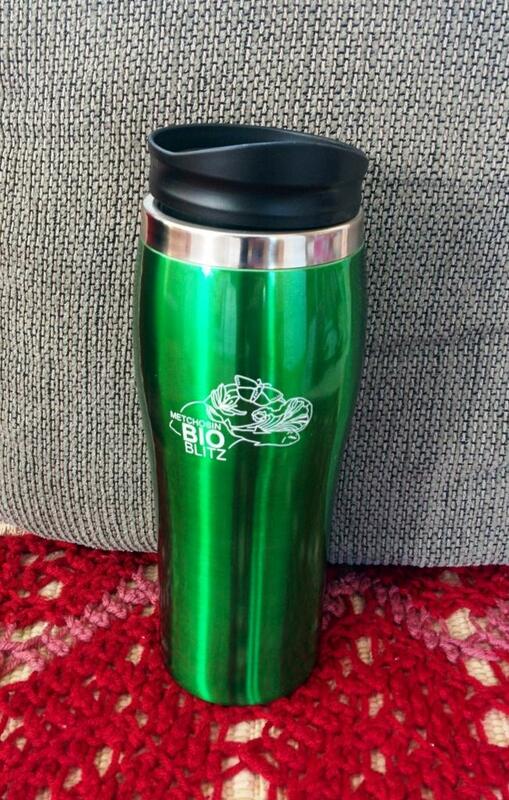 The Metchosin Biodiversity Project presented each of the members of the survey teams with insulated hot drink mugs with the BioBlitz logo. The crew, after packing up their field lunches, divided into two groups, one to go to section 62, the other to sections 64 and 66. The section 62 group gained access through private property along Sooke Road. The other group departed from the Camas Hill meeting site. Team members (l to r) were Juliet Pendray, Hans Roemer, Leanne Gallon, Daryl Thompson, Kem Luther, Terry McIntosh, Moralea Milne, Joel Ussery, Andy MacKinnon, James Holkko, Kent Brothers, Kent Anders, and Steve Joya. Picture by James Holkko. Click for larger version. 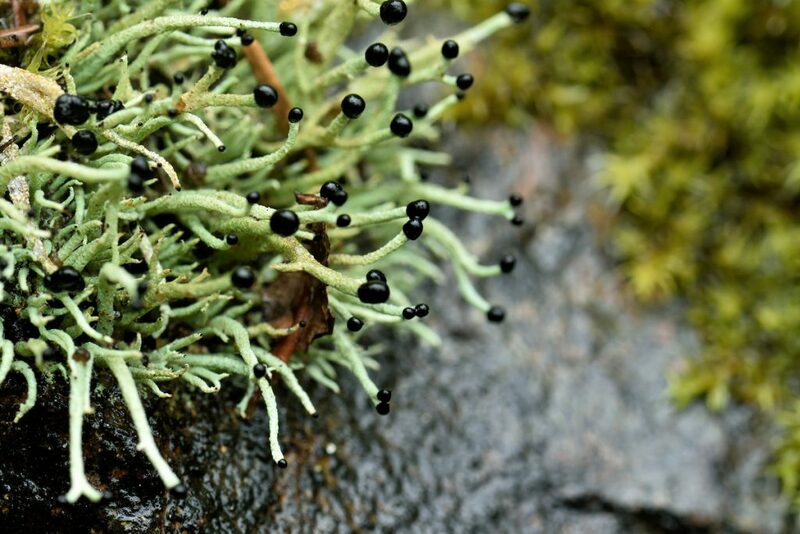 Pilophorus acicularis, one of the matchstick lichens. Picture by James Holkko. Click for larger version. Though these were the first BioBlitz teams to reconnoitre the parcels, the survey teams were not starting from scratch—they were able to build on previous work. 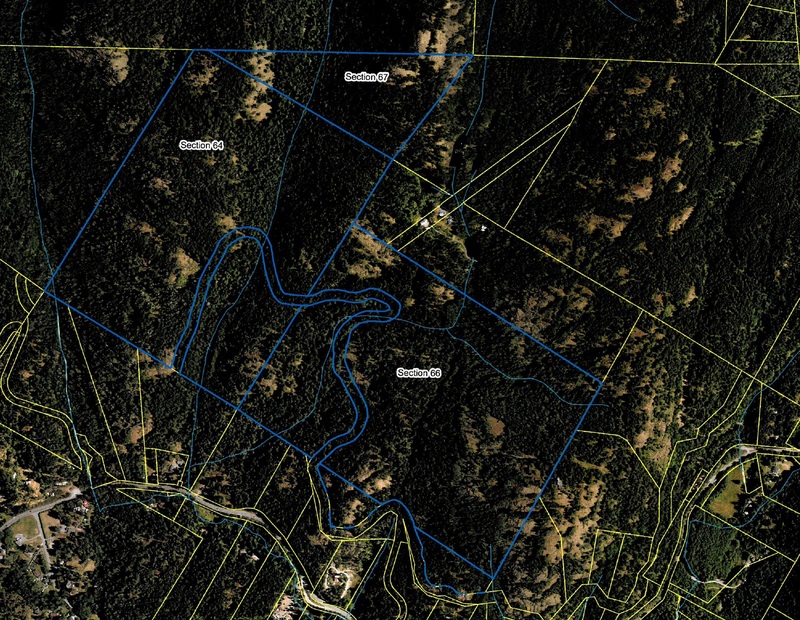 Hans Roemer, one of the members of the 2018 team, had done a species inventory of these parcels in 1979, almost 40 years earlier, as part of a proposal to include these lands in the BC Ecological Reserve system. The 2018 BioBlitz survey team was able to add another 320 species to Hans Roemer's initial 1979 tally of 150 species. 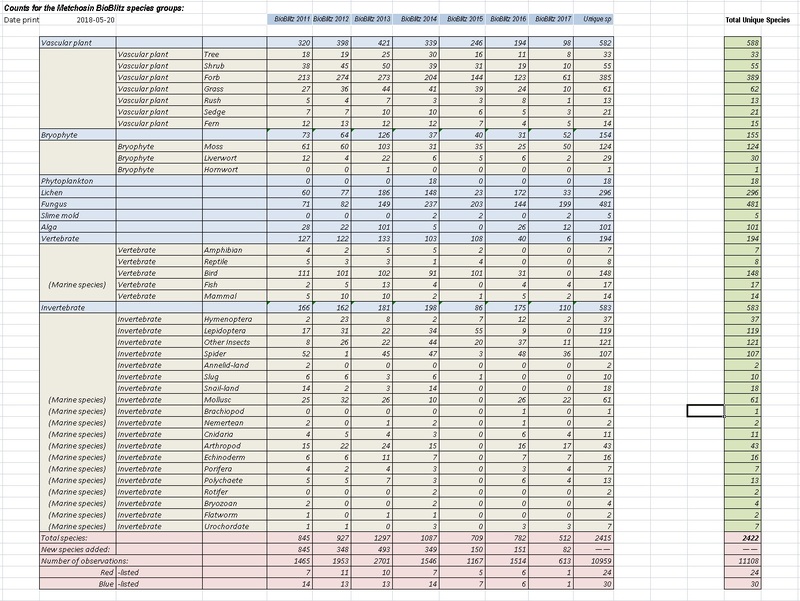 Lists of the sections 62, 64, and 67 observations can be viewed by species name and by species groups. The 530 recorded observations from 1979 and 2018 added 22 new species to the Metchosin BioBlitz database. 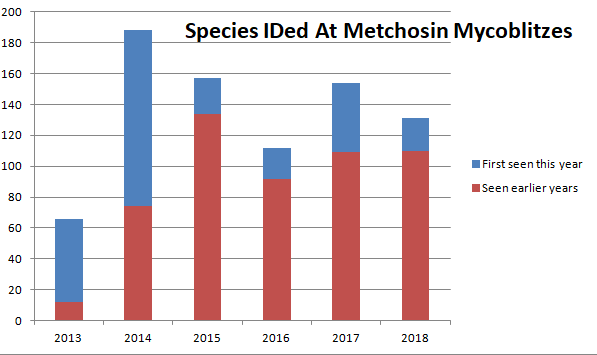 You can view the summary page of Metchosin species counts here. Polytrichum piliferum, the awned haircap moss. Taken in Section 62 by Kem Luther. Click for larger version. 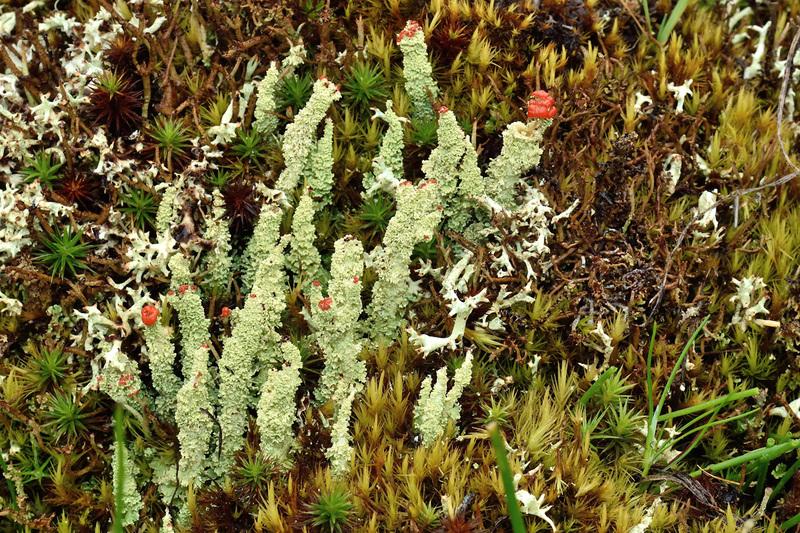 Cladonia bellidiflora, a lipstick lichen. Picture by James Holkko. Click for larger version. A big thanks to the Metchosin Foundation, My-Chosen Pizza, Royal Bay Bakery, Nootka Rose Milling, Mairi MacKinnon, and Moralea Milne for financial and food support for the 2018 Metchosin BioBlitz. A quick reminder to everyone reading this to consider entering nature and species photographs into the photography exhibit and competition coming up in October. And don’t forget to mark Metchosin Biodiversity Day (July 14) on your calendars—a one-day nature immersion at Witty’s Beach, in partnership with the CRD.